Covfefe, dotard, rocket man, moron, recuse, collusion, complicit, and #MeToo are among the words and phrases that dominated the news in 2017. So many new words became popular that the publishers of "Words with Friends" added 50,000 terms to the game. Yet a winning word stands out. One popular dictionary publisher says people looked up one word more than any other in 2017. 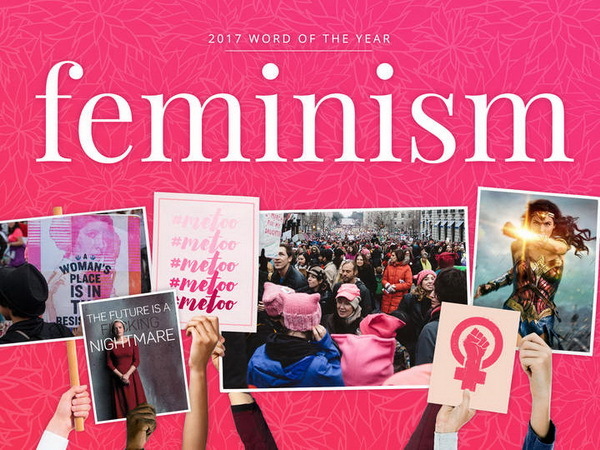 Merriam-Webster's Word of the Year is "feminism." Searches for "feminism" increased 70 percent from 2016 to 2017 on Merriam-Webster.com. It rose several times after key news events. In January, for example, discussions about the Women's March on Washington and other locations sent many people to look up "feminism." Interest in the word increased with the release of the new television series "The Handmaid's Tale" and the film "Wonder Woman." More recently, sexual assault accusations against Hollywood producer Harvey Weinstein inspired the #MeToo movement. Since then, many women have come forward to accuse rich and famous men in media, politics and entertainment. The word "feminism" was first entered in a dictionary by Noah Webster in 1841. It was defined then as "the qualities of females." Peter Sokolowski is an editor at Merriam-Webster. He told the Associated Press that "the word was used in the 19th century in a medical sense, for the physical characteristics of a developing teenager." So, what are the runners-up for the Word of the Year? "Complicit" was also a top search in 2017. Interest in the word came after a satire video from the television program "Saturday Night Live." Complicit is Dictionary.com's word of the year. Searches for "recuse" rose in reference to Attorney General Jeff Sessions and the Donald Trump-Russia investigation. "Empathy" did not make any news this year. But the word was frequently used to criticize some Republicans for what some called a lack of empathy in comments or proposed legislation. North Korean leader Kim Jong-un used the word "dotard" to describe U.S. President Donald Trump, who had called Kim "rocket man." People searched for "syzygy" on the day of the total eclipse on August 21. It means the nearly straight-line configuration of three celestial bodies in a gravitational system, such as the sun, moon and earth, during a solar or lunar eclipse. In March, "gyro" became a top search after television host Jimmy Fallon and singer Luke Bryan ordered the Greek food from a truck in a music video. The debate on healthcare in the United States Congress sent people to look up "federalism." With hurricanes Harvey, Irma, Jose and Maria causing damage in southestern U.S. and the Caribbean, people looked up hurricane to get more information. And finally, after the 2017 Academy Awards many people wanted to know more about the word "gaffe," which means a socially awkward mistake. Announcers wrongly said that "La La Land" had won Best Picture. The real Oscar winner was "Moonlight." And hundreds of people have created their own music video versions of the song on YouTube. 5.Yet a winning word stands out. He played the violin, and he stood out from all the other musicians. Many people were involved in this conspiracy, but three stand out. 6.Searches for "recuse" rose in reference to Attorney General Jeff Sessions and the Donald Trump-Russia investigation. His comment was made in reference to a study. What was that call in reference to?